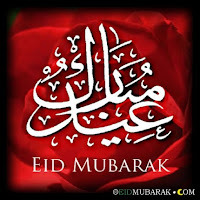 'Eid Mubarak to all kind visitors. Yeah, may the 5 or 6 of you out there. My warm wishes on the coming Eid al Fitr. May it touch your life with peace, prosperity and joy. May you be blessed by the Love of Allah and be guided by Him in all that you do. If you are travelling, my prayers for your safe journey to your destinations. Kullu 'Am Wa Antum Bi Khair.